The Sonos Play:1 is a small-but-mighty wireless speaker with a rich sound capable of filling almost any room. It streams music over Wi-Fi, is humidity resistant, and is wall or stand mountable. It can be paired with another Play:1 to turn each speaker into separate left and right channels for bigger stereo sound. It connects to an Amazon Echo or Dot for voice control. All this is available in a speaker that measures 6.36 by 4.69 by 4.69 inches and weighs just over 4 pounds. Overall, performance measurements for wireless speakers — or any small speakers, really — rarely get better than this. The frequency response for the Play:1 on-axis, 1 meter in front of the tweeter, is shown in the blue trace of the accompanying graph. Averaged response across a ±30 degree horizontal listening window is shown in the green trace. 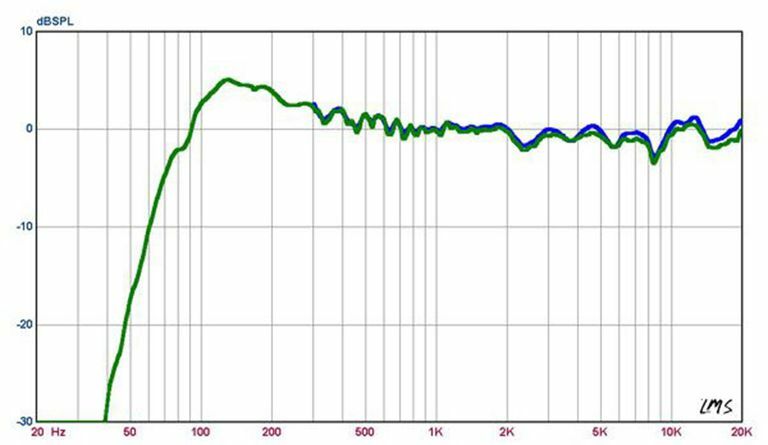 With a speaker frequency response measurement, you usually want the blue (on-axis) line to be as flat as possible and the green (averaged) response to be close to flat, perhaps with a mild reduction in treble response. This performance is one that the designer of a $3,000 per pair speaker could be proud of. On-axis, it measures ±2.7 decibels. Averaged across the listening window, it's ±2.8 dB. This means that on-axis and off-axis performance are both superb and that the Play:1 should sound pretty good no matter where you place it in a room. There is a downward tilt from the low frequencies at left to the high frequencies at right. The Sonos engineers probably did this to keep the unit sounding full. It's a well-known principle that rolling off the treble a bit in a product that doesn't produce a lot of bass gives a more natural perceived tonal balance. The downward tilt is a result of using a 3.5-inch midrange woofer, which has broad dispersion because of its small size, placing the tweeter close to the mid-woofer to minimize interference between the two drivers, and applying generous amounts of equalization using the internal digital signal processor chip. It's practically a case study in how a product like this should be designed. The -3 dB bass response of the Play:1 is 88 hertz, which is excellent for a speaker this small, and comparable to speakers with 4.5-inch woofers. Sonos seems to have put a lot of work into getting the little 3.5-inch woofer to play super deep, probably using a generous front-to-back motion range that lets it push more air and make more bass. The Play:1 has no problem with volume. It certainly plays loud enough to fill almost any home office or bedroom with sound. The Sonos Play:1 and the Sonos One are two different but similar speakers. They have a remarkably similar design and are the same weight and height. The Play:1 doesn't feature any built-in voice control, but you can control it with an Amazon Echo or Echo Dot device. The Sonos One has integrated voice control. It uses Amazon Alexa personal assistant, which allows you to do just about anything Alexa can do through the speaker. The Sonos One is a newer release and is priced somewhat higher than the Play:1, which is still a popular seller.